Tesco is understood to be bringing back the concept of its famous 90s 'Dotty' marketing campaign in a festive brand ad featuring Welsh celebrity Ruth Jones. Marketing understands the supermarket behemoth will resurrect the concept of 'Dotty' in a TV campaign launching this month, as it looks to take the brand back to its heritage and reconnect with consumers. The campaign is expected to be a far-reaching and significant investment that harks back to elements of the famous adverts of the 90s. According to senior sources, the beleaguered retailer has been exploring whether to revive the famously demanding shopper for some time and is set to bring back ads inspired by the concept and the family dynamic - but not featuring the original character. Marketing understands it will be as soon as this month, as the retailer has been filming a major TV campaign featuring Gavin and Stacey star Ruth Jones (as also reported on the Cambridge News) and comedy actor Ben Miller. The campaign, featuring the celebrities, has been shot in a Tesco store in Newmarket, according to residents on a Facebook forum local to the store. Sources have speculated to Marketing that while the ads will revive the ‘concept’ of the Dotty campaign (below), which "worked well because of the dynamic of the characters", it will refresh the theme with new faces that would better resonate with today’s consumer. 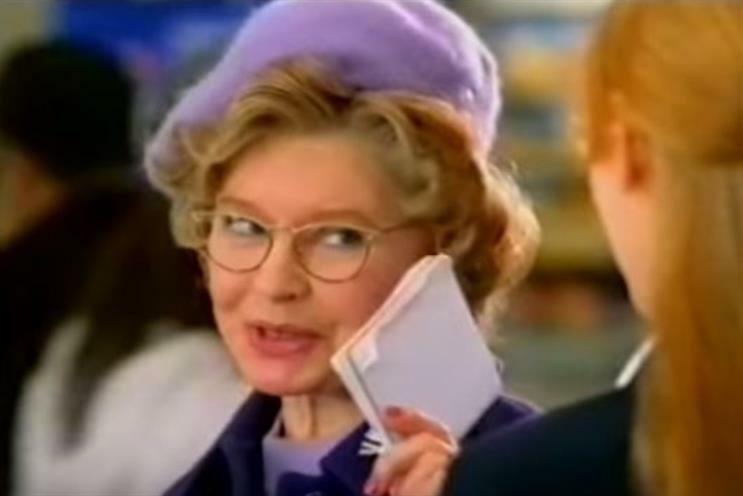 The character Dotty was first introduced in 1995 to personify the retailer's 'Every little helps' strategy and was played by Prunella Scales. Dotty was a demanding shopper always looking to put Tesco and its store initiatives to the test, much to the embarrassment of her daughter, who was played by Jane Horrocks. The much-anticipated brand campaign will be the first since Tesco appointed BBH without a pitch in January and is expected to take the retailer back to its roots as CEO Dave Lewis looks to reconnect the brand with consumers. The 'Dotty' campaign series is heralded as one of Tesco's most successful marketing initiatives and was credited with helping drive Tesco's growth and widen the gap with arch rival Sainsbury's. The campaign secured IPA Effectiveness Gold and the Grand Prix in 2000, followed by Silver in 2002. Tesco will be hoping its marketing campaign will deliver similar magic to boost its flagging sales after today it reported profits down 55%, though sales decline improved marginally. Hit by poor trading, horsemeat and the financial accounting 'scandal', Tesco is looking to turn around its brand performance. At the IGD Big Debate in London on Tuesday, CEO Dave Lewis vowed to make customers the core of the business once more. Lewis, who was formerly a marketer, revealed it had spoken to more than 8,000 people about the Tesco brand and its values, revealing its aim is to serve shoppers "a little better every day". A Tesco spokesperson said: "Our work with BBH will play an important role as we continue to reconnect with customers across the UK. We’re excited by the progress we’ve made so far and look forward to sharing this work with our customers very soon."